Local, regional, and worldwide Mennonite representatives participated Saturday at Century Center in South Bend during the closing worship service of the Indiana-Kentucky Synod of the Evangelical Lutheran Church in America as that body took steps to extend the hand of fellowship to area Anabaptists. Just prior to closing worship, an unrehearsed choir including eight Kern Road representatives along with approximately 20 more persons from seven other Goshen/Elkhart area congregations sang unaccompanied four-part harmony hymns as their contribution to a meeting of the 500-delegate session explaining the background of the Lutheran-Mennonite dialogue which dates back to 1980. A timeline on the Lutheran World Federation’s (LWF) website points out several milestones in the recent dialogue history: in 2008 the LWF Council agreed to explore whether Lutherans might apologize for their ancestors’ actions against Anabaptists during reformation times, followed in 2010 by LWF’s 11th assembly in Stuttgart asking Mennonites for forgiveness and committing itself to look at ways of implementing a reconciliation process. 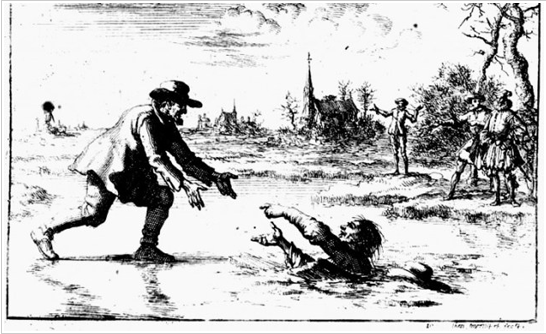 As she shared some of this history with the delegate session Saturday, Kathryn Johnson, named director in 2015 of Ecumenical and Inter-Religious Relations for the denomination, referenced the 16th century Dirk Willems story (illustration posted above) in which Dutch Anabaptist Willems rescued his pursuer from falling through melting ice. Having been imprisoned for his religious stance, Willems escaped but was rearrested after pulling the guard to safety. He was burned at the stake four days later. Lutherans had forgotten their role in that sort of religious persecution, Johnson said, until talks between them and Mennonites began. Mennonites participating at the local event Saturday included Nelson Kraybill, lead pastor at Prairie Street Mennonite Church in Elkhart and current Mennonite World Conference president, and Andre Gingerich Stoner, KRMCer who is employed by Mennonite Church USA as director of holistic witness and interchurch relations. Other singers involved with Kern Road included Lane Miller, Monica Miller, Christine Regier, Cathy Stoner, Mark Smucker, Jim and Jane Halteman. Kraybill presented a basin and towel to Bishop William Gafkjen of the ELCA, and Stoner, who indicated that “Mennonites are deeply moved by the seriousness with which Lutherans took this action,” confessed that “we have been tempted to tell the best of our story and the worst of yours. We are sorry for that." Observing that “the story of trauma still runs deep in our veins," Stoner said, "The unhealed trauma still keeps us bound in ways we don’t understand. We want to let this new reality shape us, free us, unbind us” as we walk into a new chapter in our relationship with Lutherans.